Wedding anniversaries are amazing occasions not only because they celebrate the love of two deeply involved folks, but also because they present opportunities for showing love and goodwill to an amazing couple. Here are some wishes to get you started with crafting a heart-warming wish to honor the anniversary of that beautiful couple in your life. Sending warm and lovely wishes your way, dear friend. May your beautiful marriage last to the end of time. Happy anniversary! Like fossils, which solidify over thousands of years to form precious diamonds, may your marriage strengthen and shine over the years to come. Happy anniversary! May your marriage never lack in happiness, joy, vigor, and bliss. Here’s to many more years of an exemplary connubial life. Happy anniversary! Wishing you a cornucopia of connubial bliss, now and in the years to come. You have shown the world that nothing can outlast a union founded on love and mutual respect. Happy anniversary! I’ve always admired your union. It has all the ingredients that make an excellent marriage. I’m so proud of you. Wishing you a happy anniversary and married life. To say your peerless union is beautiful is a great understatement! 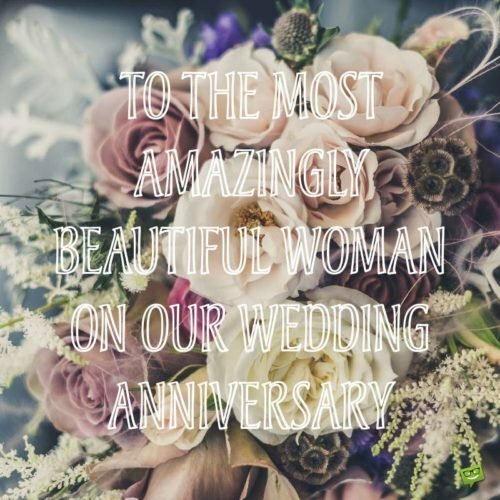 I’m glad to have witnessed your marriage withstand the turbulent waves of time and metamorphose into this extraordinary beauty that it is today. Here’s to more years of staying strong together. Happy anniversary! I’ve watched your relationship progress from just friends, to husband and wife, and now father and mother. And it’s such a beautiful thing. Wishing you a happy anniversary! Seriously, can I be like you guys when I grow up? You make marriage look so sweet and less exacting than it actually is. Sending you much respect and love on your anniversary. Your love story should make the covers of prominent magazines around the globe because it’s real and elegant. More grease to your elbows as you constantly work to make it better. Happy anniversary! I pray that you will break new ground together, soar together, and renew your love for each other till the very end. 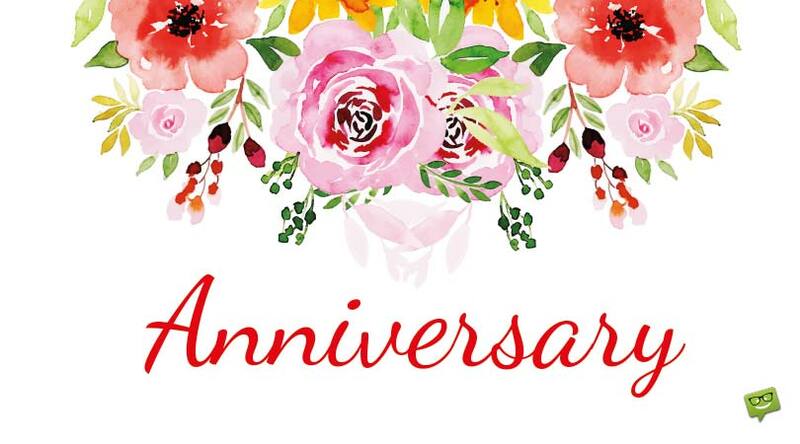 Wishing you a joyous and blissful anniversary! Although your pulchritude may wither over the coming years, we are confident that your commitment to each other will withstand the test of time. Happy anniversary! Whenever we feel uninspired and lost, we look up to your exemplary union, which teaches us how to get better. Wishing you a happy anniversary and a lasting union. Your union isn’t just one of lovers but one of beautiful and gentle souls. Long may it live and grow from grace to grace. Happy anniversary. Yours is a fire that burns brighter with each day, and from which we rekindle ours when it’s dim. From the depths of our hearts, we wish you a bright and beautiful anniversary. It’s one thing to fall in love with someone, and another to nurture and grow that love through thick and thin. The two of you have done a terrific job at both. Long may you continue to grow. Happy anniversary. The enviable health of your union is testament to the fact that you were meant for each other. May your marriage continue to increase in strength. Happy anniversary. Happy anniversary to an amazing couple! May your union never lack the vigor and luster with which it commenced. You are beautiful together. Prior to our marriage, we used yours as the yardstick for success. And even to this day, we continue to do so. Happy anniversary, and thanks for being so exemplary in all areas. Happy anniversary to one of my favorite couples in the world! How you hold your spectacular marriage together is totally awesome. You deserve all the attention, love, and admiration for your many years of working hard to sustain this beautiful union of yours. We wish you a cheerful anniversary. We are very happy to celebrate your genuine, selfless, and unfailing love for each other because it exhorts us to be just like you. Have a blessed and happy anniversary. Happy anniversary to a great couple! May your impeccable organizational skills at the office continue to shape your union and make it ever better. Of all the jobs you’ve applied to, this is the only one in which you’ve performed so well despite the curveballs it throws at you. Wishing you a blissful anniversary and married life that’s full of excellent performance. Marriage is a full time job that requires resilience and grace, and doesn’t have paid vacations. I pray that God will grant you the spirit to soar in this job. Happy anniversary. In this job, the assignments never finish but I’m confident in your ability to stay the course till the very end. Wishing you a very happy anniversary. Here’s to a full, joyful, adventurous, and fulfilling life lived together. Have a truly happy anniversary, and may your union forever be blessed with true happiness! I have no doubt that it’s taken patience, mutual respect, and humility to come this far. Unsurprisingly, these are the qualities you bring to work each day. Wishing you a fun-filled and happy anniversary. You are a couple after God’s own heart. May He bless, keep, and flourish you from now to the very end of your days. Wishing you a fantastic anniversary. Sending warm wishes of cheer, sound health, unity, and prosperity your way. You deserve all of this and many more. Happy anniversary. For another year of unity, peace, and love, I say hearty congratulations to you. You make a living example of what a properly nurtured marriage can ultimately become. Happy anniversary. May you be catapulted from power couple to super couple in the years ahead. You make such a beautiful team. I wish you a happy anniversary. Your love for each other is the envy of many in the neighborhood. Though there will be challenges ahead, I’m very hopeful that you will sail through them with grace. Wishing you a truly happy anniversary. Whenever you feel like giving in, please look back at the amazing journey the two of you have traveled so far, and you will be inspired to keep going. Happy anniversary. Dearest brother/sister, on your wedding anniversary, it’s my wish that your beautiful marriage will continue to be wonderful and full of love and happiness. God bless you and your sweet union. I’m super elated to celebrate with you another wedding anniversary. May your marriage bring you all the joy, love and sunshine you deserve. Have a great anniversary! Happy wedding anniversary to the most amazing brother/sister in the world! It is wonderful marriages like yours that give us faith in the institution of marriage. May you never stop inspiring us. On your wedding anniversary, know that your marriage is nothing short of an inspiration to everyone. May your union keep blossoming like garden roses in spring. As you celebrate another year of a blissful marriage, may the passing of time bring you more happiness and make your marriage stronger and more beautiful than it already is. Happy wedding anniversary! Dear brother/sister, your marriage is the true definition of an outstanding marriage. May God forever smile on it. Happy anniversary! I think someone very dear to me is ready to celebrate their wedding in a tremendously gargantuan way! A little bird tells me that person is you, my dear brother/sister. If the little birdie is right, then by God, today we shall party until the authorities stop us! Have a very wonderful wedding anniversary! A marriage like yours is the reason single people want to become married. I’m so proud of you. Wishing you a super blissful wedding anniversary! A more beautiful marriage I could never find! I mean it! Happy wedding anniversary, dearest sister/brother! Sweet sister/brother, wishing you all the best as you celebrate you wedding anniversary. Your joy has always been my joy, and that is why I’m so happy that you are married to that special person that completes you and brings you so much happiness. May your union forever flourish and bloom. Brother/sister, your perfect marriage inspires me like nobody’s business! Happy wedding anniversary! Hurrah! It’s your wedding anniversary today, dear son/daughter! Wishing you an extremely fabulous celebration! Let’s celebrate your wedding anniversary like there’s no tomorrow! Congratulations on your wedding anniversary, my dear. The exceptional beauty of your marriage always puts a smile on my face! Heartfelt congratulations on your wedding anniversary! Son/daughter, here’s to a truly fulfilling, happy matrimonial life. Love you so much. Wishing my sweet daughter/son a very sweet conjugal life on the occasion of her/his wedding anniversary. Happy anniversary! Son/daughter, this is the day one of the most exciting adventures of your life started. My warmest congratulations to you on your wedding anniversary. May God continue to bestow heavenly bliss and blessings upon your marriage. Happy wedding anniversary, son/daughter. May the love and happiness that filled your heart on your wedding day follow you until the end of time. I’m proud of you. 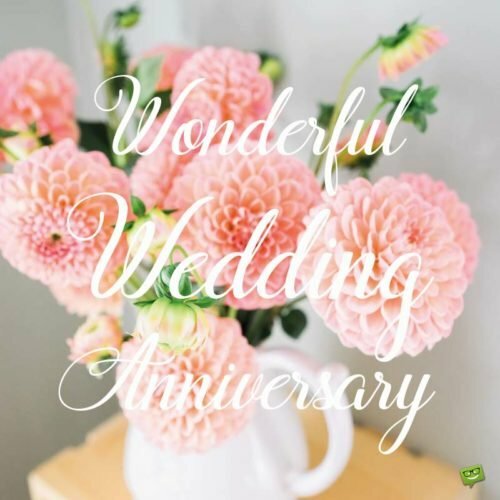 Son/daughter, I wish you a fabulously joyous wedding anniversary! May happiness always accompany your union. You always make me a proud father. Today is truly special to you, son/daughter, as it is the day a very beautiful and exciting chapter in your life began. May God bless your marriage with love, great joy and peace. Happy wedding anniversary! Wishing an exceptionally happy wedding anniversary to an exceptional son/daughter! May you continue to be blessed with all the tools needed to enjoy a truly blissful and successful marriage. Love you so much, and will always be there for you. Sweet son/daughter, I am 100% confident that your marriage will remain blissful until the end of time because it is built on the foundations of true love. Happy wedding anniversary. There’s nothing more beautiful than finding that true love of your life and spending the rest of your life with him/her. Congratulations on finding that special one. May your marital union forever be as sweet as you are to me. For me, it’s nothing short of an honor and privilege to wish you, my dearest son/daughter, all the best as you celebrate the anniversary of your wedding ceremony. May you forever be blessed with a wonderful and happy married life. Cuz, congratulations on another glorious year of a wonderful marriage! Here’s to many more wonderful years of a truly happy life as a married woman/man. On the anniversary of your wedding day, may your marriage be blessed with all the finest things that this universe can ever bestow on mankind. Happy anniversary, cousin. As you mark your wedding anniversary, I wish you a lifetime of invaluable bliss. I’m truly delighted to share this very special day with you, cousin. It’s an honor to share in the celebration of your wedding anniversary! May you forever have an abundantly happy conjugal life. Dear cousin, your marriage is absolutely beautiful. May God devote a great deal of His time in making it even more beautiful with each passing day. Happy wedding anniversary! Congratulations, dear niece/nephew, on the anniversary of your wedding. My prayer for you on this day is that your marriage will always be filled with heavenly bliss. A fabulous wedding anniversary to you, dearest niece/nephew! May the magical moments and happiness in your marriage never end. It’s been a great delight watching your marriage blossom into this beautiful, priceless treasure it has become. May you and him/her always find happiness and love in each other’s company. Have yourself a truly glorious wedding anniversary! Congratulations on your wedding anniversary, beloved nephew/niece! May your union always be immersed in the waters of delight and joy. Congrats on your wedding anniversary! Wishing you a heart full to the brim with happiness for every single precious moment of your conjugal life. May your marriage never stop being the recipient of blessings from above. May the beautiful anniversary of your wedding bless your union with more happiness than you ever imagined possible. Happy anniversary. Beyond a shadow of a doubt, your marriage is one of the most beautiful unions my eyes have ever beheld! You deserve an award for achieving this feat. Happy wedding anniversary! May God bless you with not just a happy wedding anniversary but also a truly happy married life. This anniversary is testament to the fact that you and her/him are destined to be with each other until the end of time. Happy anniversary. Warmest wishes for an awesome nephew/niece! Here’s to a wonderful marriage filled to its rim with peace, love and happiness that never end. Congrats on the anniversary of your marriage ceremony. Mere words cannot fully express how happy I am to celebrate another wonderful year of your delightful union. On this important day, I raise a glass to you and your outstanding marriage. Happy wedding anniversary, my dear!